As mentioned in a previous article, every Wednesday I will be chatting Survivor on the app ConnecTV and I want as many people as possible to join me, so I thought I would give a quick recap of the season so far. Last season, Survivor Philippines, was one of my favorite shows of last year and one of my favorite Survivor seasons of all-time. I was on a high when this season started, but that high quickly ended with the introduction of the Gota Tribe (the Fans). Overall, the Favorites tribe started off pretty well. I enjoyed everyone (relatively) and they were cranking out challenge wins. On the other hand, the Fans were annoying. We were first introduced to the “Pretty People” alliance, a group of 4 people who decided that they were the best looking on their tribe, so they should align. I am not bias just to pretty people, anyone who gives themselves a “clique” name automatically goes onto my annoying list, but this was heightened with the PPA. We were also introduced to Shamar, a war veteran who didn’t come off as the “Veteran,” as much as the “Annoying cry baby who thinks he is a king.” If they lost a challenge, it wasn’t his fault. If he was hurt, the world was coming to an end. Ironically, he was evacuated off the camp after a nasty eye infection…though most everyone on the tribe (and watching from home) was relieved to see him part ways with the game. Overall, the Gota tribe just had way too many annoying people for me to cheer for them. Reynold, a PPA-er, found the first hidden immunity idol of the season, played it, and in this past episode, but that wasn’t the craziest part of last week’s game-changing, over-the-top, episode. 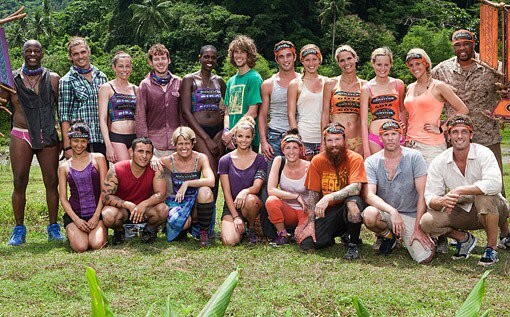 A few of the Favorites on the tribe include Brandon Hantz, who had a spiritual break down a few seasons prior, and Phillip, the “Former Federal Agent?” who always wore those red underwear. Well… there was a clash between the two. Phillip responded with just a little yelling. Brandon responded with pouring out the tribe’s rice and beans, making the Favorites tribe forfeit the immunity challenge in order for them to kick off Brandon, a lot of screaming, crazy eyes and Probst massages. It ended with an impromptu tribal council at the site of the challenge (leaving the Fans to see the melt down happen first hand… way cool! ), not shockingly, kicking Brandon out of the game. This week’s episode promises a tribe shake-up, which is always fun. I hope I caught you up enough for you to join me this Wednesday on ConnecTV. Don’t be afraid to ask me any questions during the chat or on my twitter @Marshal_Knight. While you are at it, go follow us @THRLLD! See you Wednesday!